Israeli soldiers abducted, on Thursday at dawn, seven Palestinians in the West Bank districts of Qalqilia, Tulkarem, Nablus and Salfit, after invading their homes and communities, and violently searching them, the Palestinian Prisoners’ Society (PPPS) said. The Qalqilia office of the PPS, in the northern part of the West Bank, said the soldiers abducted Mahmoud Kayed Abu ‘Adwan, 31, while he was heading to work in Hebron, in southern West bank. ‘Adwan was stopped at a sudden roadblock, near Hebron. In Tulkarem, in the northern part of the West Bank, the soldiers abducted Mahmoud Hussein Abu Hamra, 20, from Thannaba area, Mothanna Fuad Abdul-Rahim, 23, from Ezbet al-Jarad area, east of Tulkarem, and Issa Omar Odeh, 24, from Tulkarem city. Several army vehicles also invaded Qabalan town, south of the northern West Bank city of Nablus, searched homes and abducted Jihad Saleh Nashata, 31, and ‘Assef Tayyim, 24. In Salfit, in central West Bank, the soldiers invaded homes in Rafat village, and abducted one Palestinian, identified as Emad Raja Ayyash, 23. In related news, the soldiers abducted six Palestinians, including two teenagers and a female legislator, in the southern West Bank district of Hebron, during invasions and violent searches of homes. 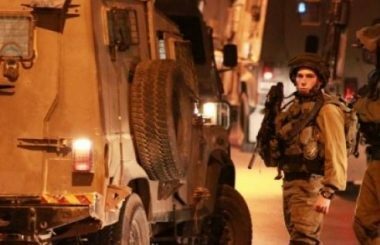 On Wednesday evening and on Thursday at dawn, the soldiers abducted six Palestinians, including children, in Shu’fat and Qalandia refugee camps, in addition to Silwan town, in occupied East Jerusalem.